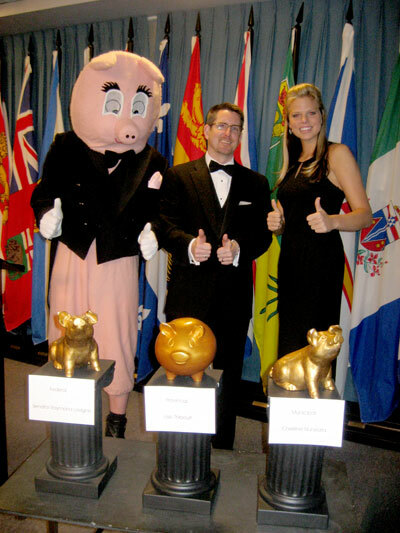 OTTAWA: The Canadian Taxpayers Federation (CTF) held its tenth annual Teddies Waste Awards Ceremony to honour the best of the worst in government spending and high taxation at a black tie news conference today on Parliament Hill. 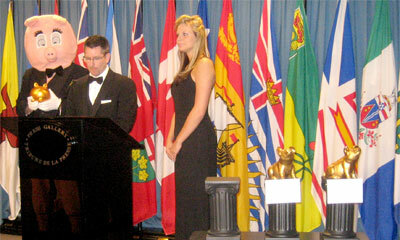 CTF Ontario Director Kevin Gaudet acted as master of ceremonies. 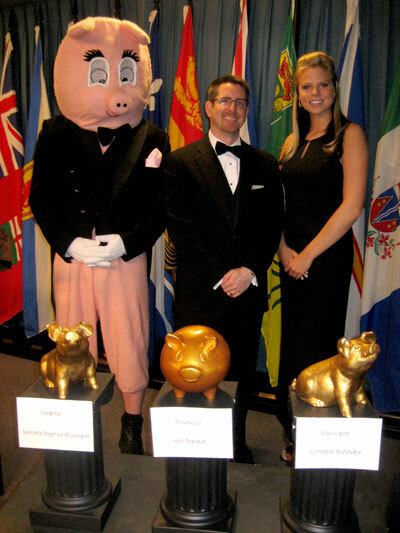 Also on hand was "Porky the Waste Hater" and Samantha, both of whom assisted in this year's ceremony. The Teddies are named for Ted Weatherill, a former senior public servant, who was terminated in 1999 for "expenses incurred by him ... incompatible with his position as Chairman of the Canada Labour Relations Board," according to the Office of the Minister of Labour. 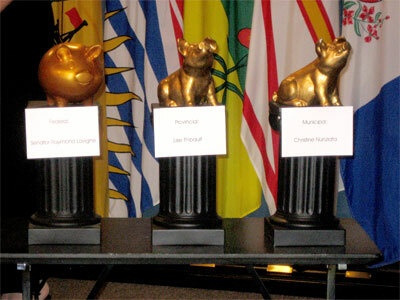 In the spirit of the entertainment awards season, Teddies are awarded annually to a government, public office holder, civil servant, department or agency that most exemplifies government waste, overspending, over-taxation, excessive regulation, lack of accountability, or any combination of the five. "Sadly, 2007 has been yet another blockbuster year for government waste," said Mr. Gaudet. "Politicians and public officials must realize that hardworking Canadians will not tolerate those who use tax dollars to live the high life. Our Teddies are an appropriate way to give them the recognition they so richly deserve. "And the federal Teddy goes to Senator Raymond Lavigne for 'Achievement in Use of Extras.' Senator Lavigne had a staffer cut down trees on his neighbour's property in West Quebec. This is the second year in a row a Senator wins the federal Teddy. Because of investigations stemming from the tree chopping, Senator Lavigne has been ordered to repay $23,500 for travel, been charged with fraud, breach of trust, and obstruction of justice and was punted from the Liberal caucus. He is a walking billboard for Senate reform," said Gaudet. Taxpayers are safer now that she is out of the job", commented Gaudet. "And the municipal Teddy goes to former Toronto Catholic School Board Trustee Christine Nunziata for 'Being Entitled to Her Entitlements.' For years she has brought wasteful spending to a whole new level with reports of numerous abuses of public money including charging taxpayers for vacations in Cuba and the Dominican Republic (where she got married), daily coffees from Tim Horton's, lingerie, $12,000 in meals in one year and much more. Taxpayers are now on the hook for the costs of her by-election after she was kicked off the board for having missed too many meetings," said Gaudet. Gaudet announced, "And the Lifetime Achievement Teddy goes to the Canadian Tax Code for having grown from 11 pages in 1917 to 2,226 pages 91 years later. The head of the Canada Revenue Agency brags that he has an army of 46,000 people and an annual budget of $4 billion to enforce the Tax Code. What was meant to be a temporary war tax measure is now ridiculously high and immensely complicated. Think of all the trees simplifying the tax code would save us. Even David Suzuki might come on board in support of lower, simpler, and flatter taxes." For more information, contact Kevin Gaudet or Adam Taylor at 613-234-6554.